Well, lookie here. You can actually plant in these vintage planters. Who knew they were good for more than q-tips, pencils and silverware? This weekend was a doosie with a capital D. My son has been sick since last Thursday with a really nasty cold, so I’ve been inside watching cartoons for 99.9% of that time. I did get to escape snot patrol for a few minutes on Saturday morning and hit a garage sale where I was able to pick up a few goodies like the bird planter ($1). It looks McCoy-esque, but it is not marked, so I’m just guessing on that. I just could not pass up this nice sized Atlas canning jar. I think it’s a half gallon size ($3). I was actually thinking of using it for a terrarium, but may just use it to hold stuff. You can’t have enough places to put stuff (said the lady on the Hoarders show). 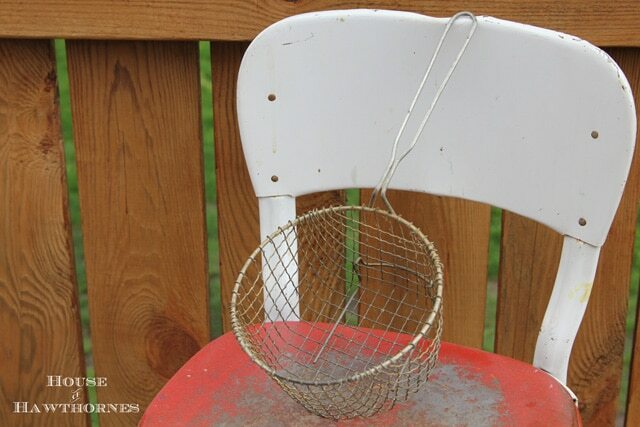 I bought the flour sifter and deep fryer basket as possible planters (50 cents and 25 cents respectfully). Can’t decide if I want to do more junk gardening this year or stay with more traditional type planters. I like the junk gardening, but there’s only so much junk you can use in the garden before your yard starts looking cluttered and the city starts knocking on your door. I’ve not gotten that far, but I do think there is a fine line there. 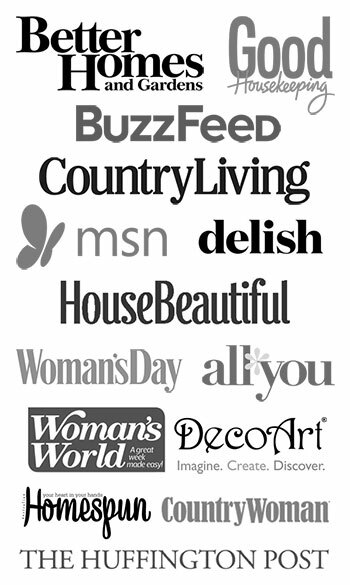 Did you find anything good when you were out this weekend? Love that bluebird vase. pretty, indeed. Hope your son feels better soon. More of all of that stuff at our house. We actually use the canning jars to store pasta. Funny post! I think your right less is more! I once saw a toilet in someone’s yard that was used as a planter.cute blue vase. Hmmm. I think as long as you don’t haul in any old cars, washing machines and chest freezers you will be okay! Love the bluebird planter…I have actually started to use planters for plants, too! Such a novel idea! And I understand what you’re getting at with the junk in the yard, I am starting to use a few big pieces rather than lots of small junk! Hope your son is feeling better! You are right about the junk gardening…I have a big yard, but have to use it sparingly. I laugh sometimes at all of us and our junking. My Granny used that same type junk to plant in because she had too. Her porch was full of flowers planted in cans and such. She started a trend I guess. Hope your son improves soon!! What great finds! Love the bird planter! Cute little planter, Pam! I know what you mean about too much junk, but I think if you stay away from toilets and used tire planters you should be safe from Barney Fife knocking at your door. Ohhh, I like your planter!! Love the little blue bird! Not many good finds to be had here this weekend. I did end up coming home with several big ugly frames (of course they got some happy spray paint) They were on 25 cents a piece so I couldn’t resist. Cartoons are the WORST! Especially if they’re those weird ones! My boys were banned from them for years, but now they are old enough where I don’t care…and they watch the weirdest cartoons ever. You little bird does look like it has a McCoy glaze on it… I wonder if they are archived somewhere on a website? It will be a fun investigation! That bluebird vase is so sweet. I hope your son feels better soon and that the germ fairy stays away from you. Bring on the junk gardening! Can’t wait to see what you are up to with your yard this year. It’s pouring again outside. Hail just came through. I swear I’m going to start building Noah’s ark in our yard. Great finds! I love the little bird planters. it’s color is so cheerful. Hope your son is feeling better soon. That little bird is adorable! 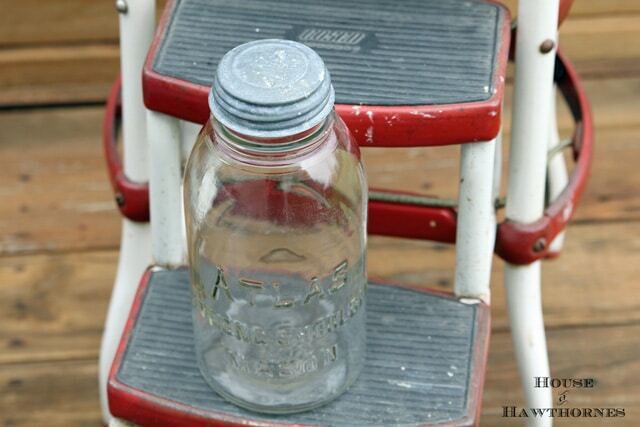 I love finding neat things but hate clutter…that’s a fine line, too! Love the sweet bird planter. Such a pretty color! I think small amounts of junk in a garden looks charming. Thanks for stopping by for a visit. Glad you had a break from snot patrol to find some great yard sale treasures. I haven’t found anything too great lately. 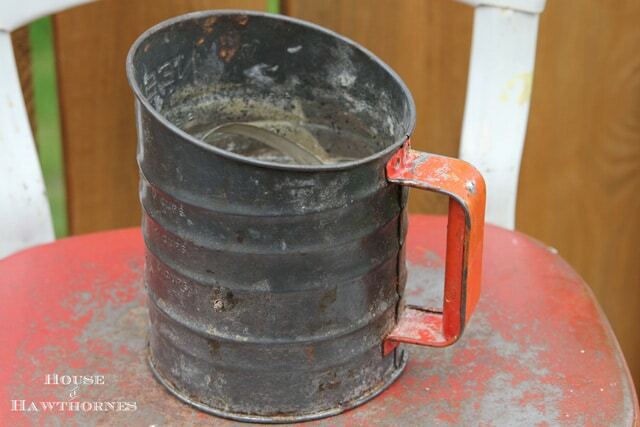 I love that big canning jar–would be great for flowers–would look great painted! I can relate to snot patrol–Gage won’t let me touch his nose for some reason–so it is like a wrestling match! Oh..forgot to say..hope your son is feeling better! I have the snots now too Pam:( Love your vintage finds, you always make them looks uber cool! 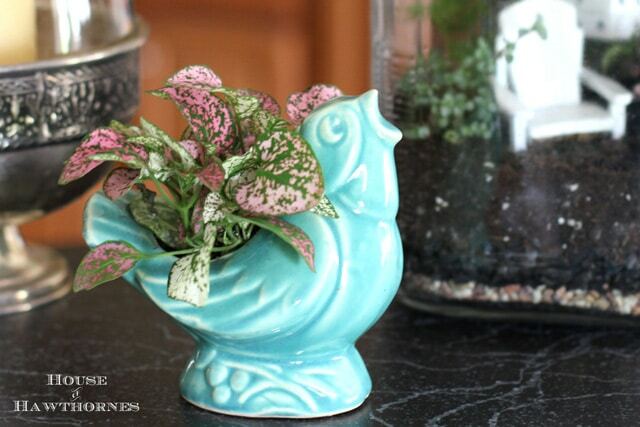 Oh, I love the bluebird planter and it is so cute to plant in them! Hope your son is doing better too! Sorry your son is sick, hope he feels better soon 🙂 The little bird planter is super cute! I was the snotter this weekend, am looking forward to being snot free this weekend… ever notice how fun the word snot is? I love the fact you junk garden, it’s a new thing for me this year cause of the fellow junk bloggers I’ve been so lucky to find! 😉 Thanks for the new inspiration! That is snot too shabby! 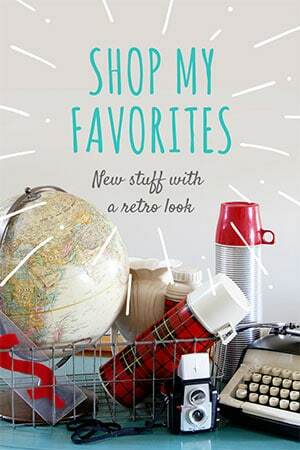 Great finds – we would have definitely gotten into a tug of war if we were shopping together! And you’re not a hoarder – since the first step is admitting the problem which you clearly have!! ha ha, gotta say your post title grabbed me and dragged me right in! Yes, I agree about the fine line. I know my neighbors wonder about all my ratty white chippy “stuff” strewn around the yard. That’s the problem with 2-story houses, you can see over the fence! Yep you have a real McCoy I have 4. 3 in yellow and one in matte white I love them. If you look it shouls be marked USA on the right back side. If it is the smaller one it may be hard to make out. It is easer to see on the large ones.